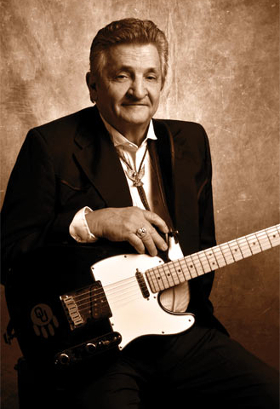 Johnny Cash’s guitarist for 30 years in his legendary backing band The Tennessee Three has passed away. Robert “Bob” Wootton, who replaced original Tennessee Three guitarist Luther Perkins in 1968, and worked with Cash all the way up until Cash’s initial retirement from touring in 1997, died on Sunday, April 9th at 3:30 p.m. in Tennessee. Born March 4, 1942 in Paris, Arkansas, Wooten moved with his family to Taft, California at the age of 8, and then to Oklahoma in 1958 where he would reside until joining Johnny Cash’s band. After graduating high school in 1961, Wootton spent three years serving in the United States Army. After the army, he began playing music locally in Oklahoma City. As a fan of Johnny Cash, he emulated the signature “chuck” on the guitar made famous by Johnny Cash’s first guitar player, Luther Perkins. According to Wootton, from an early age he knew his life’s calling was to play guitar for Johnny Cash. The first record he ever owned was one by Johnny Cash. The circumstances of Bob Wootton joining Johnny Cash’s band is the stuff of country music legend. Luther Perkins died in a house fire in 1968, leaving a vacant spot in The Tennessee Three. Carl Perkins filled in for a while, but brought his own style to the band as opposed to the famous boom-chicka-boom style of the early Cash recordings. On September 17, 1968, when Cash was performing in Fayetteville, Arkansas at a political rally for Governor Winthrop Rockefeller, a flight delay left Cash with no guitarist at all. Wootten, who was in the audience, volunteered his services, telling June Carter he could play like Luther Perkins. Wootten took the stage with Cash, June Carter, and drummer W.S. Holland, and stunned the crowd. The rest was history. For the next 30 years, Bob Wootton would be much more than just Johnny Cash’s guitarist. He often worked as a double for Cash in television shows and movies. He became Cash’s brother in law when he married Anita Carter. And after Cash’s death, Wootton devoted much of his time to keeping the memory of Johnny Cash alive. Though Cash toured rarely after 1997, and Bob Wootton was not part of Cash’s “American Recordings” era with Rick Rubin, he kept the memory and sound of the original Tennessee Three alive by touring and playing regularly with other former Tennessee Three bandmates W.S. “Fluke” Holland and others, including after Johnny Cash’s death in 2003. Bob would sing Johnny’s songs, because like Cash, he had a deep, country voice. Wootton also worked as a bus driver occasionally, piloting numerous famous bands around the United States, including a stint with The Smashing Pumpkins. According to Bob Wootton’s family obituary, he loved to fish and watch the Dallas Cowboys. He resided in Gallatin, TN, just outside of Nashville. Robert “Bob” Wooten is survived by his wife of 33 years, Vicki, and his two daughters Scarlett Keen and Montana Burgess. A funeral is being held for Wootton on Thursday, April 13th. Bob Wootton is a member of the Rockabilly Hall of Fame. One of those real-life stories that would be unbelievable if you made it up. RIP. Bob Wootton: An amazing story of destiny. Rest in Peace, Rise in Glory! A ‘stink’ with the Smashing Pumpkins? Maybe ‘stint’? I won’t forget whet a nice guy Bob, was when we got to meet him at one of his shows. A class act! He was a trooper…dedicated to music through and through. Luther gets a lot of credit for inventing the sound as he should, but someone had to keep it going and Bob did it very well. Humble, quiet, happy to be a sideman and he played a Telecaster for Johnny Cash, how cool is that?! Fun fact : There was one tour years back Cash needed a guitarist and he asked his buddy Waylon if he knew anyone he could recommend. Waylon replied that he did know someone.Cash asked for the name and Waylon said ” me Hoss”. Cash couldn’t believe it but Waylon was true to his word and Cash recalls the crowd going nuts when they saw Waylon’s telecaster in the spotlight! Cash then introduced his ” guitar player” and they went crazy! First time I’ve seen a Telecaster with a cutaway. Thanks, it’s always very interesting to read about the musicians behind the stars. Remember Robert when he was a young man playing and singing at Campmeeting Tabernacle with Bro Bob Alsup in Tulsa OK. I just learned of his death today. I was thinking of him recently and thought I’d try to get in touch with him. I first met him when I was on a tour with the band, Bad Brains. When he told us he had been Johnny Cash’s guitarist we didn’t believe him, but as he was conversing with Brains guitarist Dr. Know, it became. clear he knew what he was talking about. He said the band was fired by Cash because he wanted to replace them with younger musicians. When I told him how Norma Jean was one of my favorite singers he told me some of the inside scoop on Porter Wagoner and how he treated his female singers. Years later I got to see him perform at the MN State Fair and we had a nice chat after the show. After I re-introduced myself to him, I was going to leave so he could deal with signing autographs for people buying cd’s, but he asked me to stick around so we could talk more. That was cool. I remember it as being just a couple of years ago but it turns out it was 2011 when he was here.